The Honorary Degree is an academic degree for which Purdue University has waived the usual requirements. This degree is conferred in a way to honor those who have established a national reputation of accomplishment in their careers. Very often, these persons have been previously honored by national and international organizations; their work has been cited by peers, again on a national level, and in all cases the candidates are recognized as leaders from a very broad perspective. 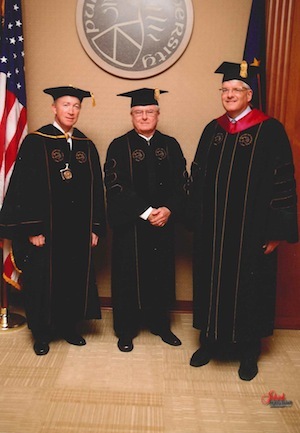 (From left) Purdue University President Mitch Daniels, 2013 College of Science honorary doctorate Dr. David S. Leckrone and Jeff Roberts, Frederick L. Hovde Dean of the College of Science.